In these days of straitened finances, the budget for scientific experiments is under attack. Particle physics is especially vulnerable, since many experimental setups cost literally billions of dollars. You may remember some years ago I decided to do an inexpensive test for the presence of dark matter. The test I devised, without benefit of guidance from real physicists, or any sound (or even unsound) theoretical basis, came up with a negative result. Of course, a negative result doesn't necessarily disprove a "theory." In this case, although most likely the theory is incorrect, it may be that the experiment was neither sensitive enough, nor carried on long enough, to have a convincing result. But, it was inexpensive, costing a few hundred dollars for material, and had the ancillary benefit of providing some money and training for a fine young lad whom I had as an intern. After working with me for a summer, he may decide that psychology will be a better trade for him to pursue than physics, but it all worked out well, negative result notwithstanding. I revisit my dark matter experiment above because today I came across a result so stunning in its implications that it obviates part of the need for yet another very expensive physics experiment, one that looks for proton decay. In brief, the proton, a positively charged nuclear particle, has always been considered to be elementary in the sense that it cannot decay into other, lighter particles. (The electron is also elementary; the neutron is not.) However, some particle physics theories hypothesize that the proton can and does decay. As always, Wikipedia offers an excellent synopsis. An experimental setup in Japan called the Super-Kamiokande was designed in part to search for this proton decay. Thus far, it has not observed any, but as usual, there are caveats. In this case it places limits for the half life of a proton at about no less than 1033 years. If it's longer, the experiment may not have detected it yet. This length is a good thing, because there are a lot of protons, and if they routinely decayed, everything would be radioactive, not just your standard #2 banana. The Super-Kamiokande is a very complicated experiment, and has produced interesting results in other fields, particularly with regard to the solar neutrino problem. But proton decay is still not conclusively resolved. 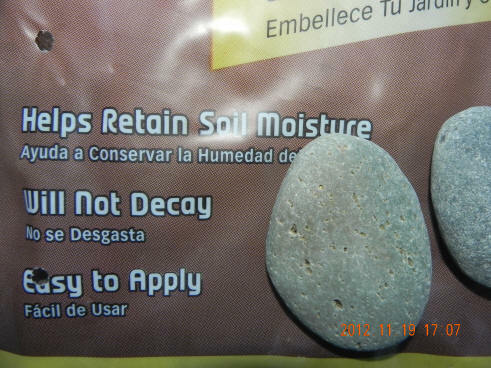 Or, at least it wasn't until this afternoon, when I found the answer lurking at Home Depot, in the gardening supply area. 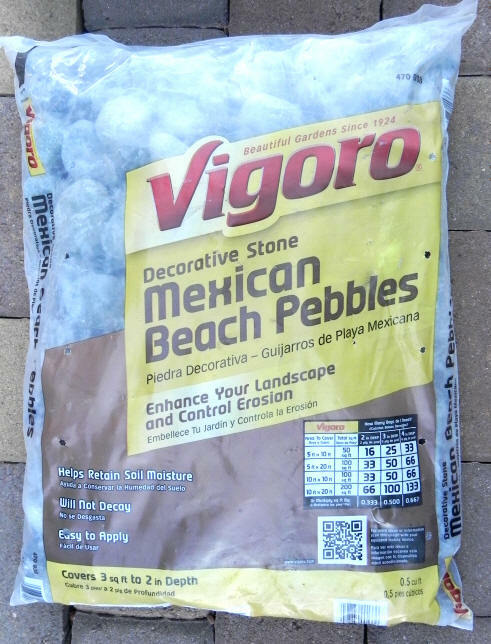 Remarkably, this unassuming bag of Mexican beach pebbles held the answer to the riddle physicists have been trying to solve with the expensive, sophisticated Super-Kamiokande. And there you have it. Rocks are approximately 50% protons by weight, and "Will Not Decay." The proton decay hypothesis is wrong, and the Standard Model is verified once again. Remember ASCII art? 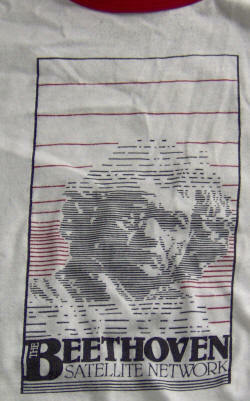 This Beethoven Satellite Network T-shirt has a portrait that might have been printed on an ancient teleprinter. And, I found if you click on a link to the Beethoven Satellite Network, your computer speakers start emitting music that might have been written by the man himself. Except that, as I was in the midst of typing "himself" the announcer said it was Mozart. So much for truth-in-naming satellite networks. No, of course I have no idea where I got the shirt.